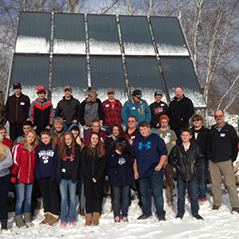 Over 500 middle and high school students from 29 school districts across Minnesota are engaging directly in community efforts to conserve energy and apply science. As they learn by doing through the Youth Energy Summit (YES!) program, they are designing and building solar powered greenhouses; producing and selling local foods; building vehicles that get hundreds of miles per gallon and boats that are powered by the sun; reducing waste and increasing recycling in their school and communities; planning ways to conserve water; and educating their peers and communities on energy conservation and renewable energy. YES! is a team-oriented youth program that uses hands-on, experiential learning and energy action projects to address energy opportunities and issues in Minnesota communities. The Atwater-Cosmos-Grove City (ACGC) YES! team noticed the school’s parking lot lights were on during early afternoon hours, wasting massive amounts of electricity. They originally planned to retrofit these lights to solar power, a technology they had learned about through their experience with YES!. After extensive research they realized that reducing their energy load should be the first step so they talked with the school board and received the go-ahead to install LED lights. They have switched 14 of the 38 parking lights to LED and plan to retrofit the remaining lights next year. Timers have been installed on all lights to ensure the lights are on only when necessary. Based on their calculations, the students anticipate their school will save 27,430 kWh and $1,108 per year. After this project is complete, the team plans to add solar panels to each light pole so the LED lights can harness energy from the sun, saving additional energy and money. In addition, YES! and Climate Generation are teaming up to host a community climate convening at the ACGC school this spring. This is just one example of 16 projects YES! teams have tackled over the last two years, ranging from planting pollinator gardens to designing and building solar boats and electric vehicles. All YES! teams are doing important work to reduce the impacts of climate change and to raise awareness of what each individual can do to be a part of the solution to today’s climate challenges. YES! is currently celebrating its 10 year anniversary with its partners Prairie Woods Environmental Learning Center, Ney Nature Center, Laurentian Environmental Center, Sauk River Watershed District and Lakes Country Service Cooperative.